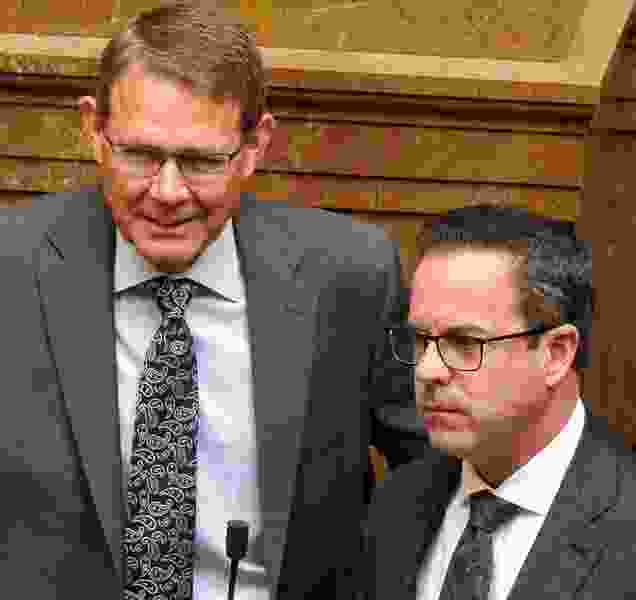 (Trent Nelson | Tribune file photo) Rep. Bradley G. Last and Rep. Brad R. Wilson, R-Kaysville, Tuesday, Jan. 30, 2018. Legislators received some unanticipated great news Wednesday: They have $209 million more than expected to spend in budgets they are now preparing. That came from projections released by legislative analysts, the Governor’s Office and the Utah Tax Commission. “The good news is our economy continues to grow” and is generating that extra unexpected money, said Rep. Brad Last, R-St. George, the House budget chairman. But somewhat ominously, he added, “The last time we have had these kind of [good] revenue numbers was 2008” — just before the Great Recession hit. “Things are going well and we’re excited about these good revenue numbers. But we always have to keep in mind that it’s not going to last forever,” Last warned. In December, lawmakers were told to expect $382 million in new ongoing revenue, plus $101 million in one time money. Now, on top of that, Last said economists project an additional $126 million in ongoing revenue, plus $83 million in one-time money. But some cash is already committed and spent — and lawmakers have found some savings by scrubbing through annual base budgets. So in total, Last said appropriators now have $453 million in new ongoing revenue to spend, and $128 million in one-time funds. So lawmakers still face some difficult decisions in what projects and bills to fund. But, “we do have some money to answer some of the problems and fill some of the requests we’ve had,” and more than expected, Stevenson said. News could get even better for budget writers on Capitol Hill. Last said changes in the federal income tax system just approved by Congress could generate another $25 million to $80 million — if Utah makes no changes in its own income tax system, which is based on federal definitions. Legislation has been introduced that would adjust to avoid that windfall and allow Utah taxpayers to keep the money — but it is also a tempting source of cash for lawmakers’ priorities. “Obviously, things are great right now in the state. Now we have the revenue numbers … we can get serious” about appropriations decisions, Last said. Gov. Gary Herbert earlier proposed in his budget to spend 72 percent of all new money on education. Much of the new funding is contained in the state’s Education Fund, opening up opportunities for additional school-related requests. A draft education budget released last week included a 3 percent increase in the weighted pupil unit, or WPU, a budget metric that roughly translates to per-student spending. The Utah Board of Education has requested a 5.5 percent increase to the WPU this year, which would be used by school districts to cover inflationary costs, hire additional teachers and fund local programs and priorities. Heidi Matthews, president of the Utah Education Association, said the bump in state revenue is encouraging in the face of challenges like large class sizes and the the high rate of turnover among educators. Tribune reporters Taylor Anderson and Benjamin Wood contributed to this story.